Excavations near the English village of Scremby in Lincolnshire have revealed more than 20 burials at the extraordinary cemetery dating back to the late fifth to mid sixth centuries AD. The cemetery was first brought to light when a local metal detectorist began to discover a number of Anglo-Saxon artefacts, including copper gilded brooches, iron shield bosses and spear heads. The dig was led by Dr Hugh Willmott and Dr Katie Hemer from the University of Sheffield’s Department of Archaeology in collaboration with Dr Adam Daubney, the Lincolnshire Finds Liaison Officer for the Portable Antiquities Scheme. International volunteers, students from the University of Sheffield, and members of the RAF from nearby stations took part in the excavation which is the first to have been extensively investigated since the 19th century. “Almost without exception, the burials were accompanied by a rich array of objects, in keeping with the funerary rites adopted during the early centuries of the Germanic migrations to eastern England,” explained Dr Hugh Willmott, Senior Lecturer in European Historical Archaeology from the University of Sheffield. “What is particularly interesting is the significant proportion of very lavish burials which belonged to women. These women wore necklaces made from sometimes hundreds of amber, glass and rock crystal beads, used personal items such as tweezers, carried fabric bags held open by elephant ivory rings, and wore exquisitely decorated brooches to fasten their clothing. In order to understand as much as possible about the site and those buried there, a series of scientific investigations are underway at the University of Sheffield. The human remains are undergoing a complete osteological assessment, whilst stable isotope analysis of teeth and bone will identify where the individuals grew up as children and what food resources they ate. “Analysis also extends to a number of the finds, including the amber beads, which are being provenanced in collaboration with colleagues from Sheffield’s Department of Physics; we will analyse the elemental composition of the metalwork and identify the elephant species which produced the ivory rings,” added Dr Katie Hemer. 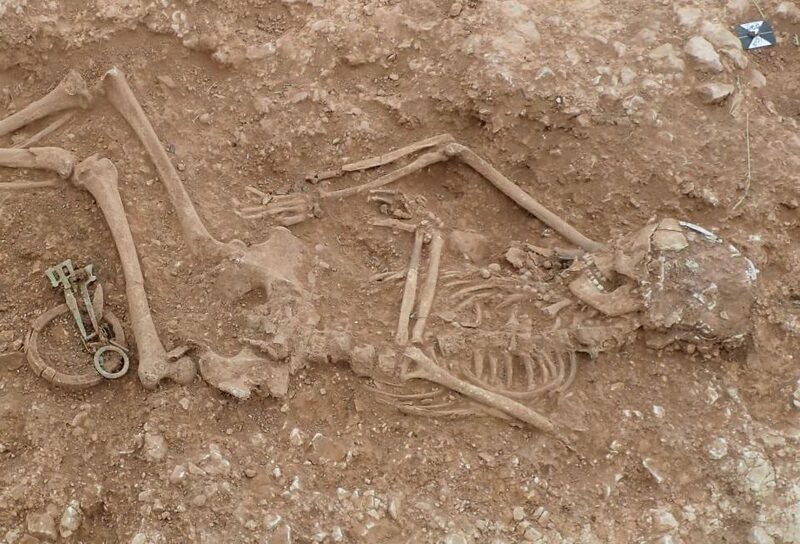 Top Image: This is a female burial unearthed at Anglo-Saxon cemetery in Lincolnshire. Photo courtesy the University of Sheffield.